So, said the renowned poet Mir Taqi Mir, over 200 years ago. If Mir were alive today, he would have been yet more heartbroken. Delhi is one of the oldest civilisations in India, and has been inhabited, plundered and destroyed time and again, dynasty after dynasty. 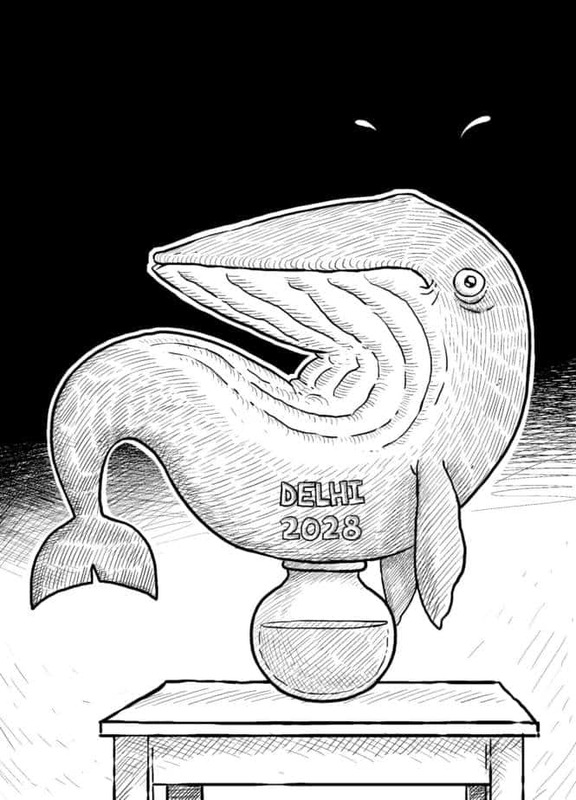 The tale of New Delhi’s future as we now see it is no different. By 2028, Delhi will overtake every other city and become the most populous city in the world. This according to a projection by the UN Department of Social and Economic Affairs (UN DESA). Tokyo is currently the most populous city in the world. By 2030, Delhi’s population is estimated to swell to 3.9 crore persons. As a result, the natural environment will be under more duress and poverty will rise, say experts. The solution he insists, is to build more houses, educational institutions and health facilities. When one thinks about the added numbers, it immediately delivers us to questions of space for homes, and roads, which are already at a breaking point. Delhi’s traffic congestion is infamous. A journey of 30 kms taking two hours at peak hours and for the unluckier ones up to five hours. Imagine the city with a crore more people and it will make any driver shudder. With more cars, comes along an added danger of rising pollution. Until May 2017, total number of vehicles in Delhi stood at 10.56 crores. Majority of that chunk are motorcycles and scooters at up to 66.48 lakh, known for being heavy polluters, that evade stringent emission standards. With an average of 1,975 vehicles added to its roads daily, Delhi registered 7% of vehicles sold in the country in 2017. With Delhi, already given the tag of the world’s most polluted megacity, by the World Health Organisation, it’s no wonder that air pollution causes 3,000 premature deaths in Delhi every year, as informed by the Supreme Court. 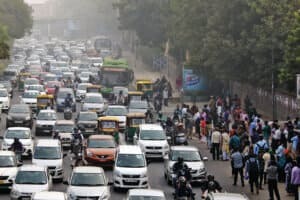 Things are likely to get worse for Delhi with more vehicular emissions, and dust particles from the rising constructions to house the growing population and industries to provide jobs. If the government does as it has promised, i.e., to replace all the cars and buses on India’s roads with electrical vehicles by 2032, we may not see the inevitable doom that awaits. But where will these vehicles ply? Government think-tank Niti Ayog’s blueprint on the plan does not talk about adding roads for these vehicles to ply on. So, is laying more metro lines the solution? Delhi Metro’s Phase 4, and proposals of more phases that await sanction, may perhaps be the light at the end of the tunnel. 27 lakh people ride on Delhi Metro lines every single day. It is a cramped pavilion of bodies in guise of commuters. Does DDA have a solution? Perhaps, 83 years before Mir’s grievance, the splendour of Delhi had yet not been lost. The now crowded bazars of Chandni Chowk, the street of silver merchants, in 1650s, were in its finest glory, with a pond that reflected moonlight, and numerous canals that radiated in all directions. But clearly that is a thing of a past long forgotten and gruesomely trampled upon. Elsewhere, a 2013 Delhi Development Authority (DDA) survey claimed an individual had 12.14 square meters (sq.m) of open space per person. And DDA has a plan up its sleeve. It’s master plan for 2021 is to accommodate the projected population of 2.3 crore people, by then, through a three-pronged strategy. One is to find ways by which the migration to Delhi can be checked. Delhi receives a flood of migrants. A report in 2011 by Indian Institute of Human Settlement (IIHS) showed that Delhi received the largest flow of migrants anywhere in urban India. However, DDA has no authority to check migration to counter the rise in population. Second strategy is to increase the population holding capacity of Delhi “within existing urban limits through redevelopment, and also deflect part of the population in the National Capital Region outside Delhi”, and the third, extending the present urban limits to the extent necessary, which would also mean pushing more people into the sub-city of Dwarka, Rohini and Narela. Doomsday — Is there a war for resources in the offing? “My world is fire and blood”, is the opening line of the post-apocalyptic film Mad Max: Fury Road, an exaggerated and also nerve-racking reminder that things could ‘hit the fan’ if we don’t do something about how we utilise our resources. A voice next proclaims “Oil wars: we’re killing for gasoline”, something that has happened already: see Iran-Iraq war, the US-led war on Iraq, the Gulf war, Niger Delta conflict, even the conflict in Syria and Russia’s involvement being cited by experts as motivated by the desire to dislodge a natural gas pipeline, which would have run through Syria. But oil shortage or war is perhaps something Delhi as a city would not face on its own, it would be a national conundrum, as we witness now with the soaring oil prices, which reached R77.4 per litre on May 24, while Mumbai got a bigger slap of R85.29 per litre (petrol). As for gasoline, the critical answer would be to switch to electric and solar power. Then there’s the water wars which — the voice (in Mad Max) reveals —happen next. Many believe the next war will be fought for this requisite element for life itself. There have already been instances in India of water creating internal divisions: see the Cauvery Water Dispute, Krishna water dispute, Narmada imbroglio and many more. Closer to home, the dispute between Delhi and Haryana with the Yamuna water. A memorandum of understanding (MoU) was signed by the five basin states in 1994 for sharing of Yamuna water, but there has been an on-off tussle. More recently, the Delhi government had in March approached the Supreme Court alleging that Haryana was supplying Delhi only 330 cusecs of water per day as against 450 cusecs per day which was agreed upon. The petitioner, Delhi Jal Board, had said that the capital was in the midst of a water crisis. The bench had then this month told the Upper Yamuna River Board that people were “dying” and derided them for not showing any urgency. In April, Niti Aayog vice-chairman Rajiv Kumar, had already sounded the bugle over what Delhi’s fate may hold. He had cautioned that like Cape Town — which is currently reeling from severe water shortage — Delhi too could in the next 15 years be “completely bereft of water”. Currently 2.9 crore citizens of Delhi are suffering. Many homes get water only once a day while many slum dwellings (where almost half of the city’s population lives), have to rely on water tankers coming each day to supply fresh water. When the city adds another crore persons, would we find ourselves staring at snaking queues like the ones for banks after demonetisation, or in actuality much worse? We would have people dying of thirst or killing for a drop. The non-profit Water Aid says that Delhi has been adding 1,000 people approximately every day, but is unable to match it with providing housing or basic amenities. “Nearly 52 per cent of Delhi’s slum dwellers are without basic services like water, electricity, sanitation, sewage system and proper housing,” it says. Delhi may want to take a cue from Singapore, which relies on Malaysia for nearly 40% of its water. For the rest, it has desalinisation plants, reservoirs of water it catches from rainfall, which also supply fresh water that undergoes further treatment. But what is rather pathbreaking is their project called ‘NEWwater’ which treats sewage water through a rigorous three-step purification. It now meets 40% of Singapore’s total water demand. And Delhi has a lot of sewage to treat. Per day, Delhi generates around 600 million gallons of sewage, but sewage treatment plants (STPs) set up in Delhi have a capacity to treat only 512.4 million gallons of waste. 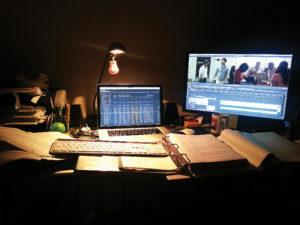 Where do the rest end up? An RTI reply in 2015, had revealed that around 2,225 million litres per day (MLD) of untreated water is either seeping into the ground or being discharged into Yamuna every day as only 40% of sewage is treated in 18 treatment plants in Delhi. This means more chances of rodents, insects and other disease-carrying vectors in the Yamuna, and in open grounds. The high chances of food contamination with sewage water, also ups the chances of various other diseases. This sewage problem is also a public nightmare with the putrid smell it emanates. But if something drastic is not done now, then in a decade, stepping outside our homes could become impossible. For sewage, Delhi Jal Board says it has provided facilities in all the approved colonies, “all 44 re-settlement colonies and 126 urban villages, 541 unauthorised-regularized colonies and 100 unauthorised colonies.” There’s still work being carried out to provide it in the remaining un-served areas. Delhi is also on its way to becoming a huge dump yard. A survey co-researched by Chintan Environmental Research and Action Group, the Delhi environment department and German NGO GIZ report in September 2017 found that about 78% Delhiites dump garbage on the roadside or in open plots in their neighbourhoods. The report ‘Making Delhi Swachh: Participatory Solid Waste Management Policy for Delhi’ found that of the total garbage generated in the city, after sending 4,500 tonne to waste-to-energy plant for incineration and 850 metric tonne for composting, at least 3,800 tonne made its way to the city’s already saturated dump sites in Narela-Bawana, Bhalaswa, Okhla and Ghazipur. Unless Delhi finds a better way for recycling this garbage, we will be wading knee-deep in waste along with the sewage. 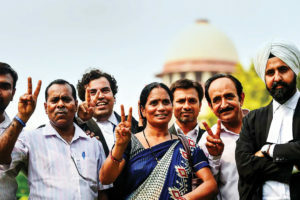 Chitra Mukherjee, head of programmes (operations) at Chintan, says that for the past 10 years they have been putting out the same concerns, yet things haven’t changed. Despite their eye-opening findings, they’ve found no implementation of “progressive rules like the Solid Waste Management Rules, 2016” by the municipalities nor the people of the city. Last year September saw a huge mound of rubbish collapse at the Ghazipur landfill causing the death of two persons. Till date, no alternative has been found. But Mukherjee says landfills aren’t the answer, as they are “just dump sites which leach into the soil, contaminating it, and our water systems”. Even Okhla’s waste to energy plant, does nothing but generate toxic fume, she says. 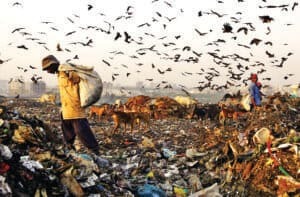 With 14,000 metric tonnes of waste being dumped every day in Delhi, which is not protected from entering our water ways and soil, the future looks grim if its residents don’t take an active role in changing the situation. The 1,50,000 people who are informal waste pickers, are currently the only ones doing this job of waste management, some aren’t even paid. Making Delhiites aware of their obligations to themselves and other around may just be one answer to this problem. For the others, authorities need to take more stringent action, see its implementation, and even reinvent technology. While the fight for space cannot have an answer except in going to Mars.